Many deodorants claim that they won’t stain your clothes, but this is not always the case. 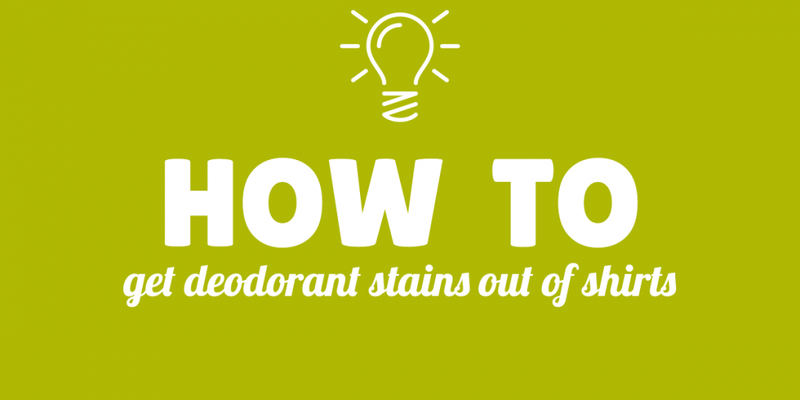 Here are a few methods to get deodorant stains out of shirts. A make-up remover is a seemingly magic tool for removing all sorts of stains including those caused by deodorants. Makeup removing wipes are the easiest to use for this particular job, but you can use liquid removers as well. If you’re in the market for some new pantyhose, you can always use your old nylons to rub out deodorant stains. This isn’t something you’ll just have lying around your home, but microfiber sponges are also a nifty tool for stain removal. If you have constant problems with underarm stains and aren’t ready to change your deodorant, then it might be time to invest in one of these sponges. Baby wipes are alcohol-free and gentle on fabrics, which makes them great for getting rid of stains. You don’t have to be fancy. You can use a washcloth as well to rub out your stains, but if you do make sure it’s not too wet, otherwise you’ll have to wait to wear that shirt another day. If all else fails, you can also find removal sponges specifically labeled as deodorant removers at your local supermarket or grocery store. They’re not only great for home use but are also good for keeping in your car or purse.